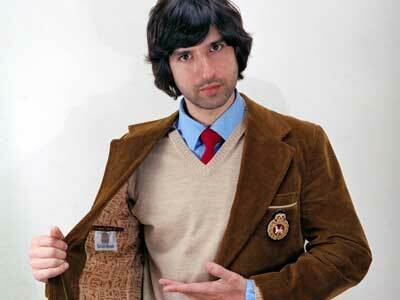 Demetri Martin is unique in the history of stand-up comedy today. He’s like the antithesis of 80s comedian Sam Kinison — that overweight, repulsive, cokehead screamer. Sammy K was a man’s-man stand-up comedian; someone who conveyed with his rage and purple-faced delivery his unhappiness with the world and everyone in it. Ready to have his stomach split open and his guts splash out onto the stage, he made stand-up look like the hard, drug- and alcohol-driven job it truly is. If Sam Kinison was some kind of 80s Thersites — the foul-mouthed, humanity-hating slave to society — then Demetri Martin is our modern-day Paris: a lover, not a hater, the shiny-eyed, self-effacing dude who plays his guitar softly, making jokes that zing but land softly in a nimbus cloud of post-hippie ethos. His first comedy special, in 2007, features a finale that was more fantasy than wit-cracking crescendo — the comedy coming from the tension created by breaking convention with what comedians do and don’t do. He plays out on his guitar a little tune while a forest setting shows the imaginary space in his mind, what he calls “the place where my jokes come from”: a place where elves romp along side jokes and his mother and grandmother appear.